Fourteen causes and organisations have been supported by a Cross Hills manufacturing firm this year as part of its ongoing commitments to the local community and its industry. 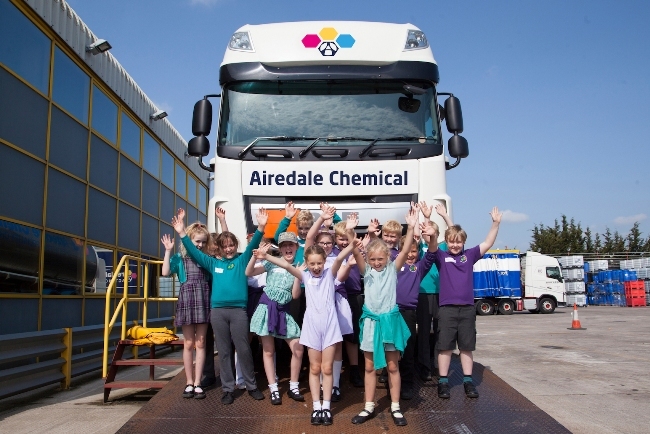 With sectors spanning from education and community to sport and staff, Airedale Chemical has raised funds for charity, donated defibrillators and inspired younger generations into the chemistry workplace. Employees at the company, which is celebrating 45 years in business this year, raised £1,000 via the tuck box which provides refreshments for staff in return for charitable donations. Funds were shared between causes including Cancer Research UK, Yorkshire Air Ambulance, Sue Ryder Manorlands Hospice, British Heart Foundation and Circus Starr; a touring show which provides free shows for vulnerable or disadvantaged children. Further to the sponsorship and charity support, a sum of the tuck shop funds was donated to sales manager, Heather Wells’ father for specialist healthcare equipment with the company also contributing additional money towards this. Chris Chadwick, managing director of the third-generation family run firm, said: “Our staff are at the heart of this business so we’re very involved in projects and funds which members of our team are passionate about. Keen on supporting its surrounding community, Airedale Chemical completed its pledge of donating three defibrillators to the Parish Councils across Cross Hills, Glusburn and Farnhill this year as well as cleaning the Cross Hills public toilets using its hero chemical product, peracetic acid. The manufacturer has also continued its relationship with neighbouring Sutton-in-Craven Community Primary School having donated £500 of science books to its school library and organised a themed poster design competition to decorate the library. Madeline Lofthouse visited the school as part of its Careers Week to talk about a career in chemistry while Year 4 pupils were invited to the company’s site to learn more about science and take part in real experiments. Daniel Marr, head of marketing at Airedale Chemical, said: “We’ve thoroughly enjoyed building on our relationship with Sutton-in-Craven Community Primary School this year; inspiring younger generations into this field is incredibly important to us which is one of the key reasons we also got involved with the inaugural Bradford Manufacturing Week this October. Airedale Chemical undertakes social responsibility under its charitable arm, the Airedale Foundation.